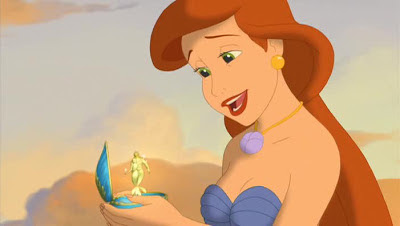 In August of 2008, almost nineteen years after the original The Little Mermaid, Walt Disney Pictures released The Little Mermaid: Ariel's Beginning on DVD. And just like that, the DisneyToon direct-to-video sequel line came to its end, courtesy of Disney's new Chief Creative Officer John Lasseter having behaved like any animation fan given virtually authoritarian control over the animated output of the Walt Disney Company would do. Oh, there was still Tinker Bell and it coterie of sequels yet to come, but those are of a different order than the 30-something DTV sequels released in the 14 years separating Ariel's Beginning from The Return of Jafar. And you know what's absolutely dumbfounding? Out of all those years and all those movies, Ariel's Beginning is the one and only actual, strict-definition prequel. That's weird, right? For the company that invented, pioneered, and then humped to death the "midquel" to have never once in all that time played around with something that already existed and had been used frequently for many years is just peculiar. Particularly since whatever problems are baked in to the very notion of a prequel (that we already know how things are obliged to turn out for the characters because of the later plot we see them involved in, and thus there's no real possibility for tension) are only exacerbated by the midquel form, which is annoying for other reasons as well. But I digress, and that's without having anything started to digress from. Ariel's Beginning announces its prequeling intentions from the very start, though honestly, what "beginning" we're meant to be witnessing is a bit murky. Ariel's conception? No, though it would answer questions about the reproductive cycle of merpeople that would be at least moderately interesting, particularly to the authors of Little Mermaid fan fiction. The incident that caused Ariel to be fascinated by human culture, setting up the primary conflict that animates The Little Mermaid? Not in the least, which frankly surprised me: even a third of the way through the prequel, I genuinely thought they were leaving that door open. Whatever mysterious backstory is cryptically alluded to by the sea witch Ursula in the original film, as she's grousing about past wrongs? Even less so, which isn't a surprise at all, though it's what I'd have personally been the most interested in seeing. In fact, there is no beginning to speak of at all. 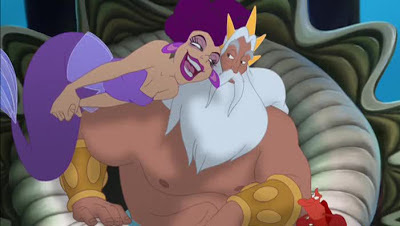 The brutally short version of the plot goes like this: merman King Triton's (Jim Cummings) wife is crushed to death by a pirate ship, and to erase the pain of remembering her and her love of music, he banishes all music from the undersea kingdom of Atlantica. Ten years later, his youngest daughter Ariel (Jodi Benson) discovers by accident an underwater music-loving community of fish and sea creatures, and discovers her own love of song. Triton finds this out and overreacts, but Ariel and friends convince him that he's wrong, in the process stopping an evil woman from taking over. It is, in other words, virtually the same plot as the first half of The Little Mermaid, with "love of music" subbed in for "love of the humans living above the water", and vastly lower stakes brought about by having a far less ambitious and interesting villain. In place of the mad octopus-woman Ursula, Ariel's Beginning makes do with resentful governess Marina Del Rey (Sally Field), who just wants to oust Sebastian the crab (Samuel E. Wright, sounding indescribably old for the part he created two decades prior) and take over as the kingdom's chief of staff. Without magic, since she is not a magic user, and thus infinitely more boring (okay, fair's fair: it's not because she has no magic that she's dull; cf. Cruella de Vil. But it doesn't help). Truthfully, this is not nearly as slavish and irritating a carbon copy of the original's plotline as was The Little Mermaid II: Return to the Sea, which really did feel in most key ways like a find + replace was done on the original script and the protagonist given a palette swap. 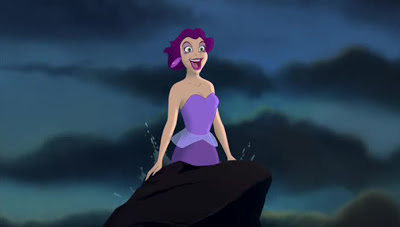 At least the emphases of Ariel's Beginning are somewhat different: there's no "I want to live above/below the water!" 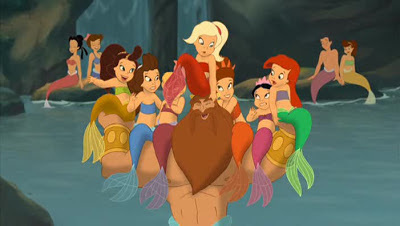 body dysmorphia, the villain is totally different (in a bad direction; but at least different), considerable focus is aimed towards Ariel's six sisters (who even have different personalities, though all of them are reductive: the horny one! the image-obsessed one! the sarcastic one!). It still hinges on an adolescent knowing more than her parent and teaching them the error of their ways, which continues to be a moral lesson that I am not 100% okay with. 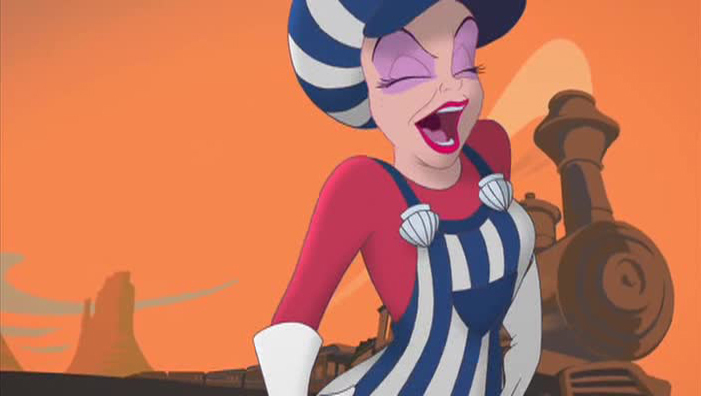 And its value as a prequel is limited almost solely to the fact that it enables a mermaid version of Ariel and a depiction of her little fish friend Flounder (Parker Goris) that isn't the exaggeratedly disgusting new character design he sported as an adult in Return to the Sea; one suspects that if there was literally even one day unaccounted-for in the chronology of The Little Mermaid, they'd have been just as happy going the midquel route, so thank God for small favors. 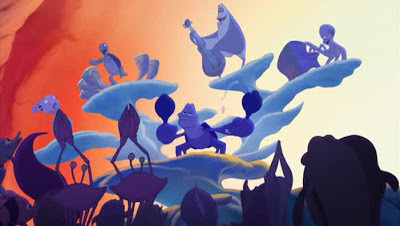 Otherwise, all that gets established are how Sebastian ended up court composer, and how Ariel and Flounder met, two questions that can hardly be considered urgent by any rational standard. It also establishes that Ariel's mother looks terrifying like a version of her daughter that has been subtly but horribly mis-drawn by a fan artist. Having stared at her for what seems like hours, I can't figure out what it is: the cheekbones? Anyway, it's like finding that your spouse has been replaced by an almost perfect alien replica: you can't say why it's wrong, only that it is, in some quiet but cosmically horrifying way. So anyway, the answer is no - the DisneyToon sequels didn't go out on a high note. Not on a low note, either, for which I am intensely grateful: just remembering that Return to the Sea exists makes Ariel's Beginning seem that much classier, just for having anything that even superficially resembles an original idea all its own. 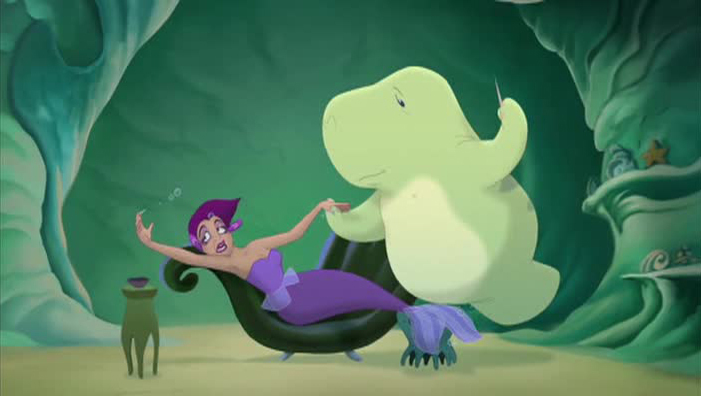 Even within the context we're dealing with, though, Ariel's Beginning feels awfully like a cash-grab, something hastily assembled out of narrative spare parts just to do something, anything, with the Little Mermaid property, because it had been so long since the last one. There's absolutely nothing about the plot nearly anxious enough to be told for anything else to be the case: a day later, and I still cannot understand how a villain as totally banal as Marina Del Rey ended up as the heir to such a ripe and robust tradition of villainy as this franchise boasts, and with the voice of a two-time Oscar winner no less. She does have a terrific lackey, a gay-coded manatee named Benjamin (Jeff Bennett) who gets the only good lines, which Bennett delivers in excellent sotto voce asides, and his character design is exquisitely well-suited for translation to a plush toy that I would totally buy, if there was any indication that such a thing had ever been manufactured. Part of me honestly wonders if the whole of Ariel's Beginning is a conscious attempt to repudiate the stakes of the first film (and by analogy, the stakes of the second film), with its legendarily dark finale in which a massive sea witch with a voice like blocks of slate is gored on the prow of a ship; the entirety of the DisneyToon ethos being, of course, "how do we make this kid-friendly property even more kid-friendly?" In this case, by neutering the sense of danger and reducing the arena from "the fate of the worlds' oceans are at stake" to "ooh, children sure do love palace bureaucratic intrigues!" There's every possibility that I'm giving the film far too much credit. Ariel's Beginning is an amazingly sloppy piece of writing, the kind of movie that includes a plot point in the first act about the protagonist and her family going for "a walk", and that's the exact word they use to describe it, when the movie that introduces that protagonist has a plot that centers on her sorrow at not having feet. The English language is full of synonyms for "go for a walk", and not a single one of them connotes so unavoidably "the act of moving your legs one at a time; the legs you don't have to such a degree that the narrative universe revolves around it". Nor is it the only place where the film seems to out-and-out forget that it takes place under the sea, though thankfully, most of the examples are limited to the film's cramped, unimaginative visuals, and not the script. While I have called this "sloppy", it would be just as fair to call it "indifferent", for the animating spirit of the project is a particularly resigned sense of the arbitrary. It could well be that this was the result of the film being completed under the cloud of knowing that the boss basically hates what you're doing and is only letting you finish because of the time and money already sunk into the job. Although this certainly isn't the first Disney sequel to suffer from a clear feeling that nobody cared about the story they were telling, and none of the others were made under the shadow of Lasseter's wrath, so it's likelier to just be that "a prequel to The Little Mermaid where the emotional battleground is largely identical to that movie" didn't inspire anybody's best work. Who could have guessed? There's a lot of disinterest going around, at any rate. The air is leaking from every corner: the plot's refusal to be about anything; the anemic new songs (including what might very well be the worst villain song in any Disney DTV film); Marina's total lack of any personality not given to her by a tiring assortment of wardrobe changes. Even more damningly, the fact that the main song that serves as a showstopper and a spine for the musical landscape - "Part of Your World" and "Under the Sea" in one package - is a cover of "Jump in the Line". Which, minimally, makes the question of when and where the Little Mermaid pictures take place even harder to parse, while speaking to an utter barrenness of inspiration. 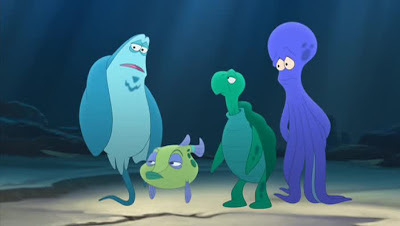 Not that "Jump in the Line" doesn't fit in the same musical universe as "Under the Sea", but... when you've already got "Under the Sea", shouldn't you at least try to give that little calypso crab something to do? At least the film has some compensations visually. True, the sense of unbridled imagination present in every movement of the original film is gone - the joy of animating in a three-dimensional underwater space is barely present. 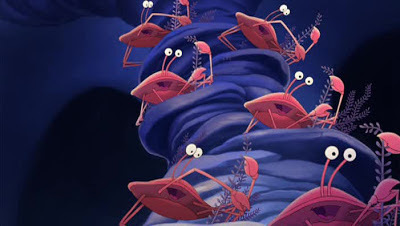 Also, there are crabs in a couple of scenes, and they're realistic - handsomely drafted, but when we've established that crabs in this universe look like little cartoon men with cute, mutable faces, we should not be subjected to actual arthropods. That being said, the lighting is wonderfully sophisticated, for a DisneyToon Studios production, and while it's not always the most fluidly-animated thing, there are very few of the ungainly, stiff moments that tend to creep into all of these movies. The colors are rich and bright, and if they are a somewhat over-saturated mismatch with the original film's hazy shades of aqua, the film is still addictive eye candy taken on its own terms. It's not hard to imagine a child being entranced by all of this shininess, and ultimately, that's all that's going on here; distracting kids for an hour and a quarter. It's too bad that this couldn't be accomplished with a rich, thematically deep narrative carried by resonant characters - or at least the free-for-all weirdness of Cinderella III: A Twist in Time - but there's no value in making that complaint at this stage of the game. The reign of Disney sequels ended as it began: cheapening classic characters and assuming the worst of its target audience's intelligence and dignity. But at least it looked a whole lot plusher in 2008 than in 1994. At least some evolution in the direction of artistry happened in all that long march of mediocrity.